Christmas Tree Worms are one of my favourite things to find when snorkelling on the Great Barrier Reef, and so in the spirit of Christmas, here are some fast facts about these little guys. I bet your bottom dollar they'll be the first thing you go looking for when you snorkel straight from the back of the boat on your next luxury charter in the Whitsundays! For those who celebrate Christmas, tree decorating comes once a year, but in the world's tropical seas, 'tis always the season! Christmas tree worms (Spirobranchus giganteus) are a type of polychaete, a group of segmented worms that contains over 13,000 species. And just like their cousins the "sea mice" and feather dusters, these unassuming invertebrates put on quite the eye-catching display. The Seuss-style plumes you see above – which come in an array of colour morphs – are called "crowns", and you'll notice they appear in pairs. That's because each worm has two of them. By pumping water up and over the crowns, a Christmas tree worm can filter out tiny plants and animals to snack on. The feathery structures are lined with both sticky mucus and spiky bristles (called cilia), which help trap passing prey. While many invertebrates reproduce asexually, there are actually male and female Christmas tree worms. These animals are broadcast spawners, meaning they shoot their genetic contribution into the surrounding water, in the hope that it meets its match. Once fertilisation occurs, it takes just 24 hours for larvae to develop. The Whitsunday Islands are home to some of the best dive sites on the Great Barrier Reef, and when you're chartering a bareboat or a luxury crewed charter, you should consider ways you can explore the underwater world as well. At first you may think that it's 'too hard' to organise, but with a little understanding of what your options there are, you'll soon realize just how easy it is to dive on one of the great natural wonders of the world. There are various day charters that offer introductory and certified dives, visiting the fringing reef around the skirts of the islands as well as the outer reef, approximately 40 nautical miles out to sea. Leaving from Port of Airlie in Airlie Beach, Cruise Whitsundays makes a short stop at Daydream Island (as of now shut for repair and reopening mid-2018) and Hamilton Island to get visitors before going to 'Heart Pontoon' at Hardy Reef. The 2-hour excursion will take you on a beautiful scenic cruise through the islands, travelling at high speed in comfort on 'Seaflight' a 37-meter wave-piercer catamaran. Once at the Heart Pontoon, there are various activities to do, however for the keen divers, the 'moon pool' underneath the pontoon is the place you'll begin your dive taking you out along Hardy Reef; a vertical coral wall that drops to 60m underneath the boat. A wealth of ocean life can be found including turtles, anemones, hump headed Maori Wrasse and Giant Trevallies. All meals and refreshments are incorporated into the ticket cost and you spend roughly 4 hours at Heart Pontoon, with up to 370 different visitors on busy days. 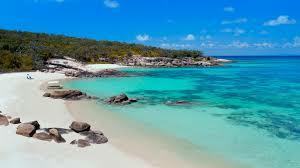 Explore leave Hamilton Island going to 2 dive areas at Bait Reef, the nearest reef to the Whitsundays. While their vessel can take up to 100 guests, they top numbers at 60 making for a more intimate experience. Jumping straight from the back of the vessel from the drop down stairs into the water has you diving with marine life within seconds. The 'Stepping Stones' are a group of coral bommies that form a near straight pathway of reef which resembles a series of stepping stones as the name suggests. The marine life here is out of this world, with humpback whales known to visit during their annual migration which divers have been known to hear singing under the water during their dive. 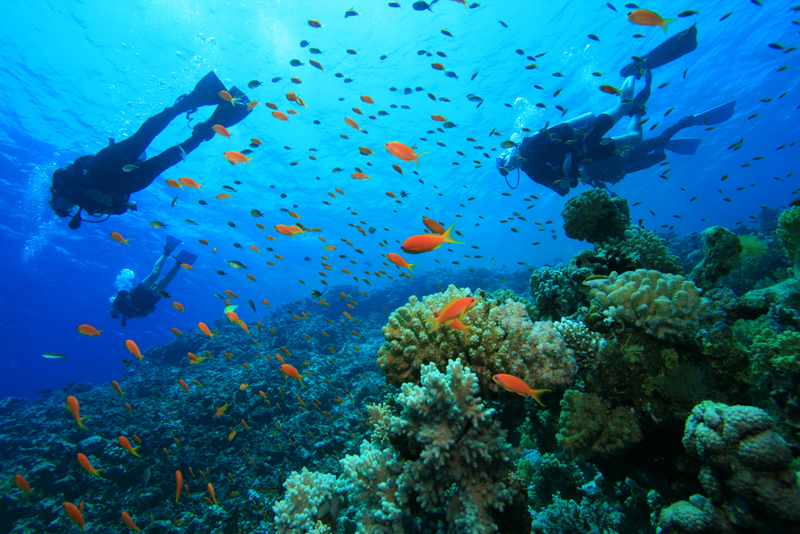 You spend at least 3.5 hours at the dive site before making a beeline back to Hamilton Island. Meals and refreshments are included in the ticket price. If you're on a bareboat, pick up a mooring or drop anchor near an island resort that the day cruises pick up from and make your way ashore, leaving your tender somewhere safe for the day. For those doing a luxury crewed charter, the crew can transfer you in to the marina to jump on the cruise. 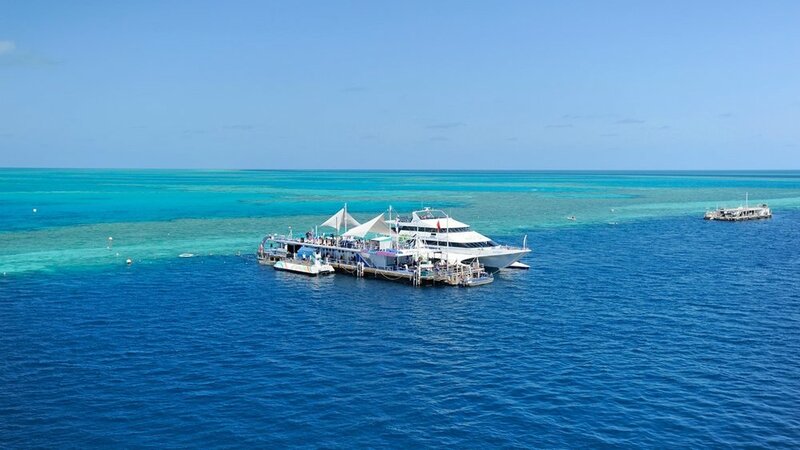 On the off chance that going through the day with a huge crowd of people and being away from your boat all day isn't your thing, you may want to dive the reef around the islands, known as fringing reef. There are a more delicate coral varieties found around the islands because of the protection that the islands offer with each dive site unique in its own way. You can meet Mantaray Charters or Whitsunday Bullet who visit certain islands depending on the weather on the day. More often than not they'll pick you up from your vessel in their dinghy, or on the other hand, you can take your dinghy to their boat when they are ready to take you for your dive. The bonus of meeting up with this type of charter means that you are only paying for the dive itself, rather than the full ticket price of the outer reef cruises. Tornado Dive is a dedicated dive vessel who can meet you at a dive site. If you contact them 24 hours before you want to dive, they will organize to meet you at a suitable anchoring and take you and your crew for a dive. Depending on how busy they are on the day, you may find that you are the only divers they are meeting, which makes for a much more casual and private experience, getting that one on one time with the dive instructor. If meeting up with other boats and diving with other groups of people isn't your thing, or if you're looking for a more laid-back experience and you're already a certified diver, you can hire your dive equipment from Aqua Dive at Abell Point Marina and take everything you need with you. Some of the crewed luxury charter boats may already have dive equipment on board, so be sure to check this first if you're considering diving. Aqua Dive will provide a dive map with the equipment, showing you where you can find the best dive sites as well as locations of where you can refill your dive tanks at various locations around the islands, or from Tornado Dive. Depending on the size of your bareboat, a maximum of 4 tanks can be taken on board. If diving BYO, be sure to raise your dive flag so other boaties know there are divers in the vicinity, and always scuba dive in buddy pairs.